Aster Alpine Pink Aster Alpinus is a compact-growing perennial native to the European Alps and Spanish Pyrenees. 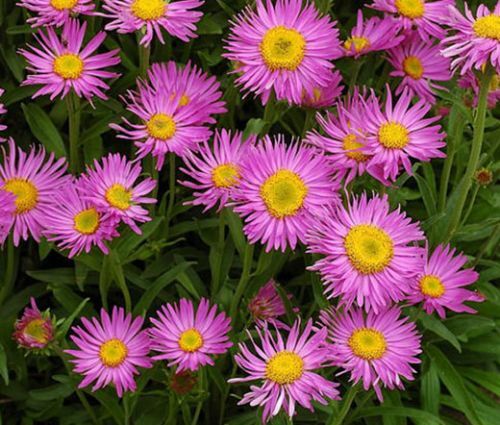 Aster Alpine can be started from seeds, and this attractive flower produces mounds of showy, daisy-like, deep-pink flowers with yellow centers on a top of bright-green, dense foliage that remain its color throughout the season. The masses of pink flowers appear from late spring and throughout the summer, and blooming Alpine Aster is highly attractive to butterflies and bees. Aster Alpine makes a spectacular display in rock gardens and containers, borders and mass plantings. Aster Alpinus grows best in full sun or partial shade and prefers moist, but well drained soil. Pink Alpine Aster tolerates drought and adapts to a wide range of soils reseeding itself freely under right conditions.